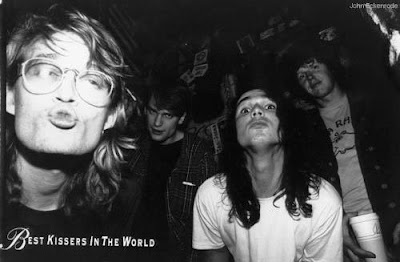 Stallion Alert - Record Collecting - Portland, OR: Special Report: Best Kissers In The World Reuniting! Gerald Collier has re-assembled the band with new members, and we're now based in Portland, OR. The set in Seattle will consist of songs from Been There, the Puddin' EP, and the unreleased MCA album Goodbye Yellow Brick Roadkill in addition to some new tunes. We're actively writing and rehearsing and planning a much broader reach next year. We are playing at the Tractor Tavern in Seattle on July 30 and then the next night, July 31, at Dante's in Portland, OR. We have an unconfirmed date in Eugene at the beginning of October and plan to do more West Coast stuff in the coming months. After that we'll be writing, recording, and branching out to other areas of the country.